Infuse and blend science, technology, engineering, arts, and mathematics instruction while modeling real world problem solving with these rich resources1. 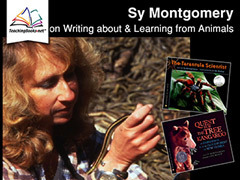 Build observation and communication skills by hearing how authors and illustrators document and share research. Explore the discipline of daily journaling in Sy Montgomery's Meet-the-Author Movie she shares how writing can be a struggle. Demonstrate the processes of planning and revision with nonfiction books that model inquiry thinking. Read as Steve Sheinkin describes his research and note-taking process as a kind of detective work in his TeachingBooks.net Blog post discussing Bomb: The Race to Build—and Steal—The World's Most Dangerous Weapon. Inspire and motivate using examples of creativity and innovation. Examine a lifetime of wonder and learning with Jennifer Berne's Meet-the-Author book reading from On a Beam of Light: A Story of Albert Einstein. Extend content understanding and build background with digital resources for texts that blend disciplinary knowledge. Bring to light the interdependence of blended disciplines on innovation with Tim Grove's Meet-the-Author Book Reading from First Flight Around the World: The Adventures of American Fliers Who Won the Race.